As an A-student at a large public high school in Bell, CA, Milla Anderson did picture college in her future. But coming from a low-income family, none of whom had ever been to college, that future and how to get there was fuzzy at best. But an older student referred Milla to College Match, and her journey to college and all that entailed was brought into sharper focus. College Match, started in 2002 by Harley Frankel, a former director of the National Head Start program, helps high-achieving, low-income students at Los Angeles public high schools navigate their way to the country’s top colleges and universities – places like Harvard, Brown, Stanford, Dartmouth, UC Berkeley and other top-ranked schools, campuses where many of the program’s participants had never imagined they’d find a place. The program, which currently operates at 24 high schools and this year includes 185 juniors and 175 seniors, supports students through the often bewildering two-year process of SAT and AP testing, applications, essay-writing and financial aid. And the formula clearly works. All College Match students are admitted to four-year institutions, and three-quarters of those are top 25-ranked. 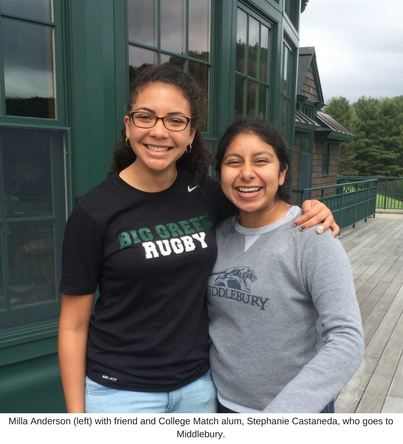 This year’s crop of students saw 33 acceptances to Middlebury College alone. The program also includes visits to numerous campuses around the country, something students with limited financial means can rarely do on their own. “That was one of the most valuable parts of the program,” said Milla, who visited about a dozen campuses through the program, and learned that she could aspire to an Ivy-league school and pay less than a UC. Between top choices Harvard and Dartmouth, she ultimately chose Dartmouth. Though thrilled with her choice, the culture shock of a new life at an elite college made her miss the support she’d had through College Match. So she tapped into the growing network of College Match students at campuses around the country, recruiting 97 upperclassmen from 31 colleges in 14 states and matching them with freshmen. A new mentorship program was born, along with the start of a critical alumni network. “People were really interested in giving back to the program,” she said. “We all come from the same kind of communities. We’re all really talented and smart low-income students figuring our way through campuses made up of mostly white, upper class students…being able to talk to someone who understands your struggle really goes a long way to helping minority students.” This summer, Milla will work at College Match to strengthen and expand the program for fall semester. As College Match continues to grow and expand, Harley finds it still to the program’s benefit to continue operating under fiscal sponsorship. “I think Community Partners is one of the big reasons why we’ve done so well,” he says. “I don’t have to worry about all that complicated stuff.” It allows him to focus on other challenges that present themselves. This year, especially, required special attention to the needs and concerns of DACA students and their families, including discussions with immigration lawyers about the safety of out-of-state travel. In response, Harley is putting increased focus on exploring California schools. “We have to,” he says.